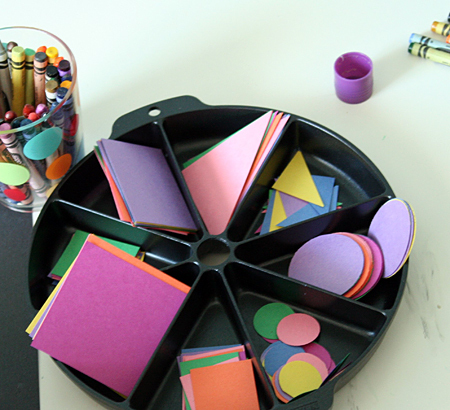 Step 1: Surprise your young artists with a tray of colorful paper shapes. Step 2: Make sure the glue is handy. Stand back and let the creating begin! 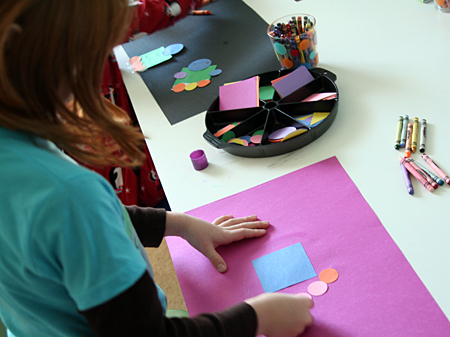 Step 3: Ooh and aah over the shape-inspired masterpieces. What a great tray to hold your paper…where ever did you find it? 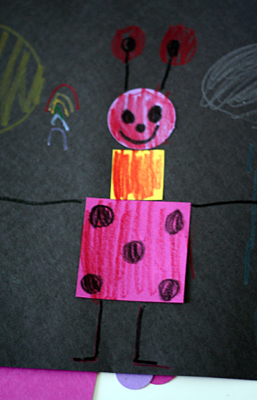 I love doing shape collages with my students and I adore that polka-dot critter! I just tried this with my two (almost three year old) and we had a blast! I blogged about it on my own blog if you care to see our adventure with your fun idea! Thanks for posting this! I’m going to start cutting now. I’ve been looking for some new sorts of things to do with my son and I think he’s going to like this. Love your blog! Lots of fun ideas! Check out some of my ideas at http://www.oneshetwoshe.blogspot.com. Not necessarily all kids ideas, but ideas none the less. what a cute simple idea. I’ve bookmarked this for my rainday/I’m bored stash. 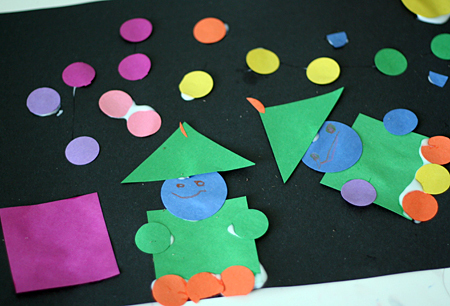 We just did shape collages the other day too! This is a great idea! I love the way you displayed the shapes! I tweeted this.